and re-engagement offerings to help developers reach the right users at the right time. 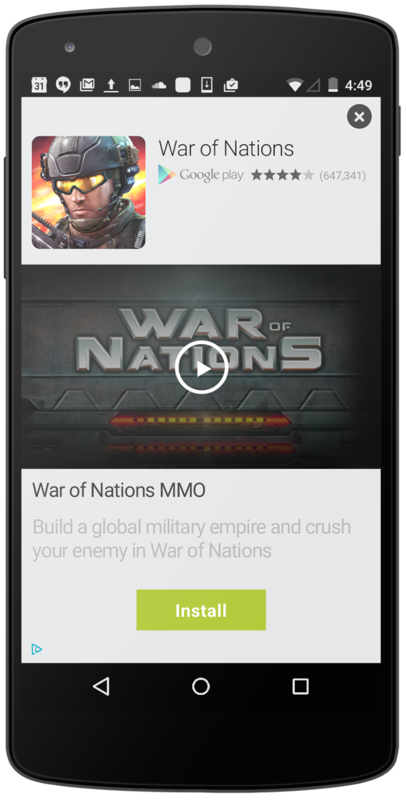 We’re also continuing to improve our in-app ad formats across Android and iOS to provide users with richer, more engaging content. You can now reach them with Video App Promo Ads - immersive, interstitial video ads that highlight how users will interact with your app. GREE International, the global maker of popular free-to-play mobile games like Knights & Dragons and War of Nations, has utilized a variety of new app promotion features to grow performance. While installs are the first step to securing engagement with your app, we recognize that not all installs are created equal. To help you reach these high-value users for Android, we are introducing Conversion Optimizer for in-app buyers. By using paid app install and in-app purchase insights from the Google Play app store, this new feature helps optimize bids for in-app buyers to maximize value from your installs. Fiksu, a leading mobile marketing and technology company, has generated greater value from gaming app installs by using this new bidding strategy. "By leveraging Google's Conversion Optimizer for in-app buyers, we were able to triple one client's install-to-purchase conversion rate after users download the app and decrease cost per purchaser by 61%,” says Ken Kehoe, Performance Labs Analyst at Fiksu. “The ROI using this strategy has been incredible, maximizing the lifetime value of users, and it's something we're excited to extend to more of our clients." The extension of app install campaigns to the mobile GDN, new engaging ad formats, and automated bidding for in-app buyers are just a few new features to help you promote your apps. To learn more about Google’s app promotion products, visit our Help Center and read our best practices for driving app installs. Our phones are filled with apps that have fast become lifestyle companions. We have apps for playing games, watching TV, working out, tracking our finances and more. Since the average smartphone user already has 36 apps on his or her phone, it’s more important than ever for developers to find effective ways to reach and keep users. That’s why Google is continuing to enhance our app promotion and re-engagement offerings to help developers reach the right users at the right time.